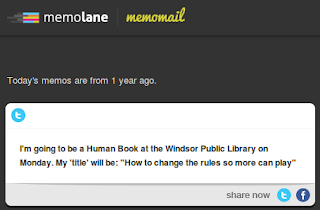 Intrigued, I followed a link and found someone writing about libraries, cities as software and a connection to the open government movement... which was something I was just doing in my own talk/post! It felt good, as it always does, to find a fellow traveller. Even better, I found that another post from Hugh Rundle's ("Return to the Coffeehouse") connected nicely to something I was trying to get across and so I added a screenshot and linked to it to make evident the connection. In that post, Hugh applies possible lessons from Steven Johnson’s Where good ideas come from: the natural history of innovation that libraries could do well to learn from. I had also read and enjoyed Where good ideas come from and have been meaning to put some of Johnson's recommendations into personal practice. While I keep my own Commonplace book, as Johnson recommends, I had not yet made a habit of returning to my older notes to pick up the threads of thought that I had put down which Johnson believes is almost necessary for long hunches to be developed. I had completely forgotten that I had come up with that title for myself and I realized that this title was closer to a personal mission statement than my the current tag-line on my portfolio site, public spaces need public events - the one that I just spent on thinking about improving over the last few weeks. Still thinking of new tag-lines. Working on variations of "Changing the rules so that more can..." participate? join in? play? I had been introduced to Vinay through the game of Evoke which had set me on the path of developing a tag-line in the first place. So. "Changing the rules so more can win" is my new mantra, my new mission, and shortly, my new tagline. It captures the work that I want to pursue in the contexts of social justice, environmental justice, local governance, gaming, and even librarianship. Which isn't really the point of this (another!) self-indulgent post. 1. The discovery process is remarkably social, and the social interactions come in amazingly diverse forms. Sometimes it's overhearing a conversation on Twitter between two complete strangers; sometimes it's the virtual book club of something like Findings; sometimes it's going out to lunch with a friend and bouncing new ideas off them. It's the social life of information, in John Seely Brown and Paul Duguid's wonderful phrase -- we just have so many more ways of being social now. 4. Very few of the key links came from the traditional approach of reading a work and then following the citations included in the endnotes. The reading was still critical, of course, but the connective branches turned out to lie in the social layer of commentary outside of the work. 5. It’s been said it a thousand times before, by me and many others, but it's worth repeating again: people who think the Web is killing off serendipity are not using it correctly. 6. Finally, this simple, but amazing fact: almost none of this--Twitter, blogs, PDFs, eBooks, Google, Findings--would have been intelligible to a writer fifteen years ago. If it isn't already clear, here's some evidence: By linking to his work into my post, I *may* have introduced Hugh to R. David Lankes. From this comment from Amy Buckland, I found another fellow traveller in Char Booth. All of the above have one degree of separation to Nate Hill whose LibraryLab is the setting the groundwork for the physical manifestation of Dan Chudnov's own personal mission "help people build their own libraries" and it was his post - from 2006 - that set me on my own journey to find my own personal mission/tagline. Which leads us to today. I hate to ruin your story but it wasn't you who introduced me to R David Lankes - I've been interested in his work for a little while now. I have however found Twitter to be an exceptionally effective 'connection maker' - a lot of my more recent posts have come about because of the connections I've been able to make between various things people who don't know each other have posted on Twitter. It's not a stretch to say Twitter has made me a much better librarian and introduced me to far more 'professional reading' than anything else. Strangely I've also found that people who have tweeted links to my posts are often themselves producing quite interesting content (eg yourself). As long as you don't let it become too much of an echo-chamber it becomes a real engine of new connections and ideas. Looking forward to reading more from you. Hey Hugh! I wasn't sure about adding said link because it does not surprise me that you already know of Lankes and his work. I don't think the truth ruins the story though. I think almost all of us who use twitter have personal experiences when we can see a person or idea we discover be passed on to others. In fact, it happens so much (with RTs and such) that the remarkableness of it all sometimes gets forgotten.